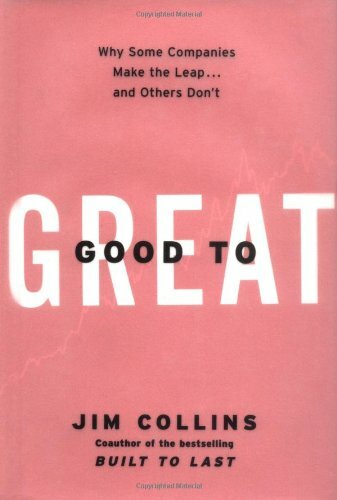 For this book, Jim Collins and his the team tried to find out how some companies were able to make the leap from good to great: Through data mining (stock prices etc.) they identified a dozen companies who were "good" first, but suddenly were able to outperform their competitors over a long period ("great"). Then the actual work begun, they analysed these companies in order to come up with a handful of common attributes. First of all, the leaders of these companies were not overly charismatic, they were humble and team oriented. Collins assumes that charismatic leaders might be able to achieve short term success, but in the long run they would become irreplaceable, doing more harm than good. Another key point these companies shared was their emphasis on the team members, and not on strategy: Get the right people on the bus, get the wrong people off the bus. Collins argues that a good team can achieve anything, while a strategy is easily rendered useless if the circumstances change. To me this is a key point the book makes. Being able to confront brutal facts was another attribute the researchers identified in the great companies: Realism beats optimism. Collins mentioned prisoners in a concentration camp: often the overly optimistic prisoners broke down after a few months, but the ones who were able to adapt to the circumstances prevailed. An important aspect is also that any member of an organisation should be encouraged on pointing out weaknesses, not hiding them. » where can your company be best in the world? » what are you deeply passionate about? » what can be economically viable? 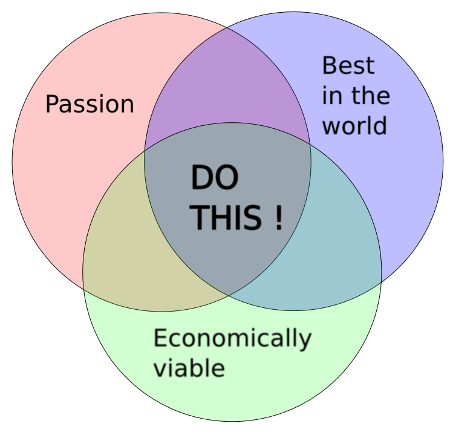 Your company should only be active where these three circles overlap. I really like this approach and will try using it. In the end Collins points out that the great companies had been mediocre before, and that it took a lot of time and effort to make the leap to being great. You should not be discouraged easily, but stick to these basic principles over a longer period of time in order to gain momentum. What appears to be an overnight sensation is likely the result of years of preparation.